Time Warner shareholders cast a resounding vote on Wednesday in support of the company's proposed $85.4 billion merger with AT&T, setting the stage for the federal government's review of the deal. The vote was held at a special meeting in Atlanta with shareholders for Time Warner, which is the parent company of CNN, HBO, TNT and others. The company's CEO Jeff Bewkes said in a statement that "78% of our outstanding shares" voted in favor of the merger, "and of the shares voted, 99% were cast in favor of the proposal." "The adoption of the merger agreement by our shareholders keeps us on track, pending regulatory consents or reviews, to close the transaction before year-end 2017," Bewkes said. Approval from the shareholders was expected; getting the green light from the government could prove more challenging. President Donald Trump voiced opposition to the merger during last year's presidential campaign, promising to reject a deal he said would result in "too much concentration of power in the hands of too few." There has also been speculation that Trump could try to quash the deal as retribution against CNN, which he has repeatedly maligned as "fake news." AT&T CEO Randall Stephenson, who met with Trump about a week before the president took office, said at a conference last month that he welcomes the scrutiny of being associated with CNN. "It's not the first time that we'll have been in a controversial area," he said. "We are a rather large company. We face hundreds of thousands of consumers everyday." Bewkes and Stephenson faced some skeptical lawmakers on Capitol Hill in December during a congressional hearing on the proposed merger. One such critic, Sen. Al Franken (D-MN), wondered if the merged companies would charge rivals such as Comcast more for access to Time Warner's entertainment offerings. "You'd have every reason to do this if you could," Franken said at the hearing. Bewkes disputed that suggestion, saying it "would make no sense" to shun the likes of Comcast and Verizon. In his statement on Wednesday, Bewkes said combining forces with AT&T will "accelerate our ability to innovate, develop and deliver the next generation of video services, making our content more valuable and spurring innovation in the media industry." 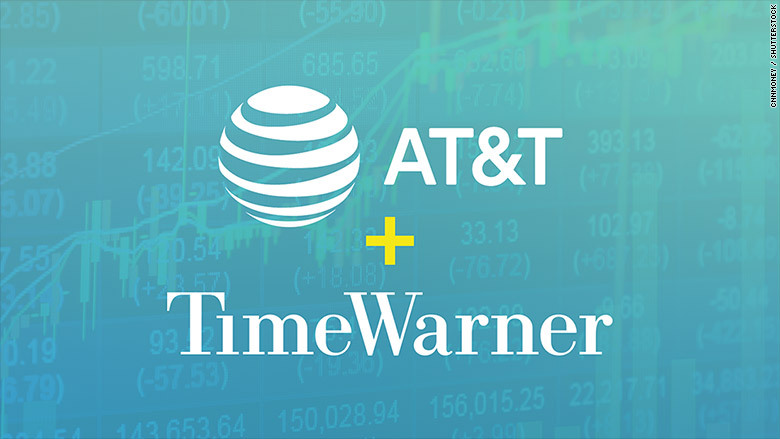 "While today is an important milestone in the transaction with AT&T, we'll continue to do what we do every day across Time Warner: create the very best content and share it with the world," Bewkes said.